The usual home of the 80-member professional ensemble, the McAninch Arts Center at College of DuPage, is still under renovation so the goup is playing in a smaller space at Gary United Methodist Chuch in Wheaton. He also heard her on NPR’s “From the Top,” a weekly show that highlights the best pre-collegiate music students in the country. May teaches beginning band La Grange Elementary District 102 and is on the applied music staff at College of DuPage. Muspratt is also artistic director and music director of the Dupage Opera Theatre, music director of the Northwest Indiana Symphony Orchestra and the South Shore Summer Music Festival. And he is particularly eager that audiences know something about the composer and his times before he begins the program. Subjects range from whether Mozart would have used a piano or a harpsichord for this piano concertos. (Answer, piano but they were much softer that pianos today.) If the questions are more complicated, such as recommending a good teacher for a fledgling violinist, he gets in touch with the questioner personally. May and others in the orchestra have been working for the past two years on developing a patrons group to provide additional financial support of the New Philharmonic. The ensemble has been “on the road” since the fall of 2012 when the College of DuPage began its $35 million renovation. Attendance declined so precipitously during that period that the balance of the 2012-13 season was cancelled. 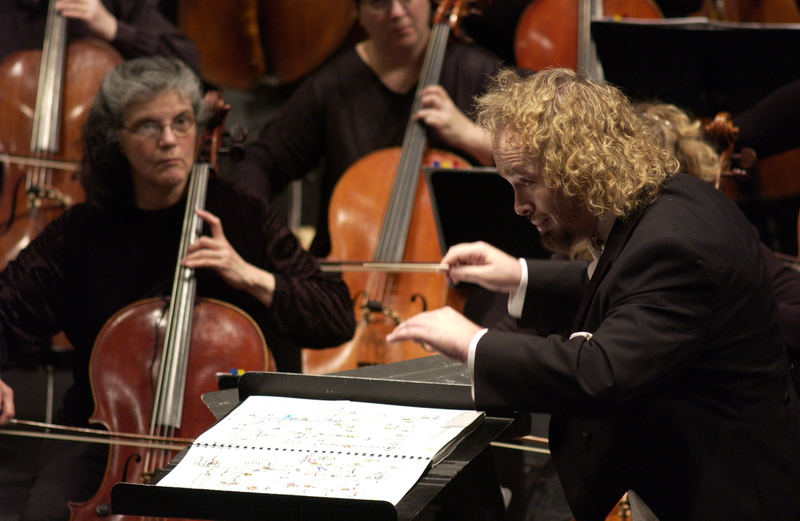 But members of the orchestra and the MAC staff sent pledge cards to possible patrons, with the goal of $150,000 annually, and to date 70 percent of the goal has been raised.